When I spoke to the two-time reigning CESAFI MVP yesterday, Greg Slaughter corrected me. 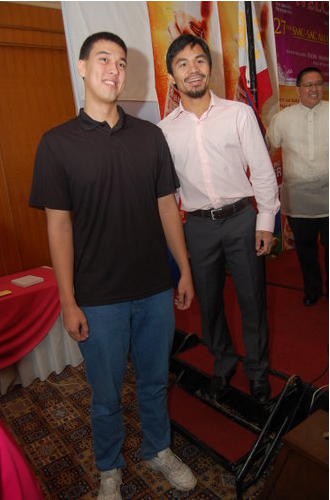 “Are you ready for the match-up of the two tallest men in Cebu?” I asked. “You mean the two tallest players in the whole Philippines!” answered Greg. Oh, yes. Greg Slaughter is Herculean. He stands 7-feet-tall. Jun Fajardo (above photo) is gargantuan. He’s 6-foot-9. In the history of Cebu basketball—and possibly of the entire Philippine collegiate basketball—this is the most sky-scraping and towering of contests. Think about it. One is mammoth; the other, monstrous. One is a behemoth; the other, a leviathan. When one extends his arms upwards to the Cebu Coliseum ceiling, he nearly touches the 10-foot-tall ring. When the other stretches his arms sideways, it’s like seeing a Jumbo 747 jet’s full wingspan. Can you imagine Greg and Jun, one backing up to score, the other, defending? One slamming a dunk; the other, blocking a skyhook? This is dramatic and breathtaking. Unlike anything we have seen before in Cebu. “For Greg, this is a major challenge,” said UV head coach Elmer “Boy” Cabahug, when we spoke yesterday noon. “Unlike the previous years when Greg was able to dominate, this season, he has a counterpart in Fajardo. He has someone na kapareha niya (who’s his equal). This UC versus UV quarrel will be an irrepressible confrontation. 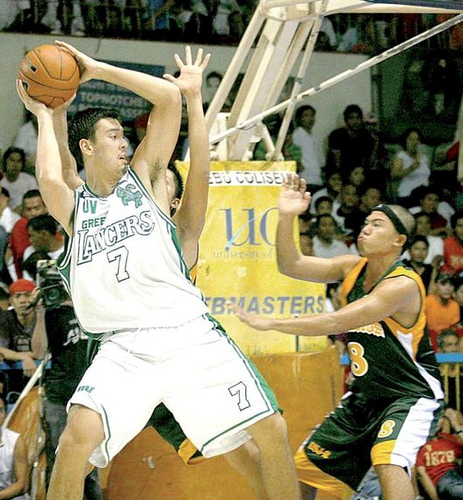 There’s the electricity of the “Twin Towers.” There’s the Green Lancers aiming for their ninth straight CESAFI title. There’s the UC Webmasters targeting an upset win for their first trophy. And, of course, there are the tens of thousands of UC and UV students. Can you imagine how boisterous and ear-splitting the Cebu Coliseum will be later today? Here’s another intriguing fact: In the only time they met this season, UC beat UV. That was in the league’s first game when UC won 75-73. I admire Boy Cabahug. Not only for his achievements as a PBA player and as UV coach, but also for his humility. He doesn’t boast. He doesn’t gloat. You can see it on court. You can sense it speaking to him. Jun Fajardo and the University of Cebu, obviously, think otherwise. So… Hercules or Goliath? Take your giant pick.